This last week, the OKCMQG was asked to participate in the Oklahoma Winter Quilt Show. We were given a booth and a HUGE space to display approximately 30 quilts. For those of you who have been with the guild from our early days of 6 quilters huddled around a table, you know what a tremendous opportunity this was for us! It's kind of like that scene from the movie "The Jerk" when Steve Martin's character sees his name in the phone book and he screams, "I'm somebody now!" I signed up to help "man" the booth Saturday afternoon. Photos and comments from other members had been posted on Facebook the previous two days and I was excited to hear some of those comments for myself and talk to people about modern quilting. BIG THANKS to The Modern Quilt Guild for lending us this AMAZING quilted banner! "That's not modern. That's just messy quilting." "I'm not a quilter, but these are the kind of quilts I like!" "That's the kind of quilting I like! It really speaks to me." Overall, we had a very positive experience. One woman's eyes, literally, lit up when she saw our quilts! I'm pretty sure we'll be seeing her at our next meeting. I also observed a man in his late 20's view the quilts as if he were in a museum. He stood still as he thoughtfully studied them, one by one. I thought, "That's right. Quilts are cool!" 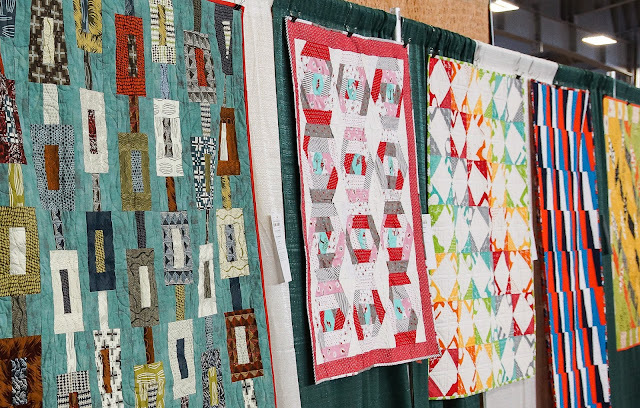 The show also gave us a chance to meet quilters from other guilds not just in Oklahoma, but also from neighboring states. 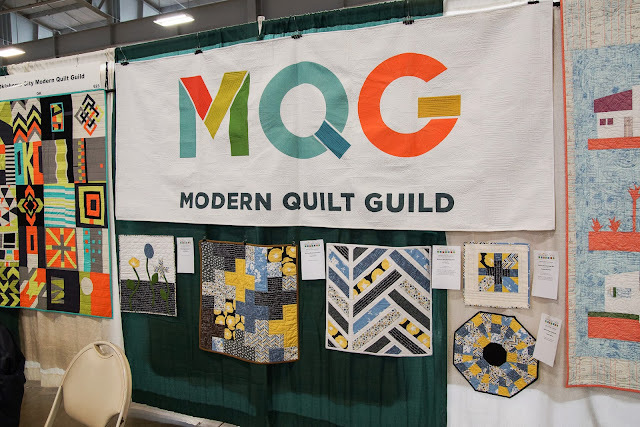 We talked about free-motion quilting, the next QuitCon….and...seriously...what's more fun than that? THANK YOU! THANK YOU! to Ann Solinski and Shirlene Davis, the masterminds behind the planning and organization. Thanks to all who assisted in set-up, manning the booth, take-down and, of course, lending quilts. It takes a team to put on a show and we couldn't have done it without all of you! 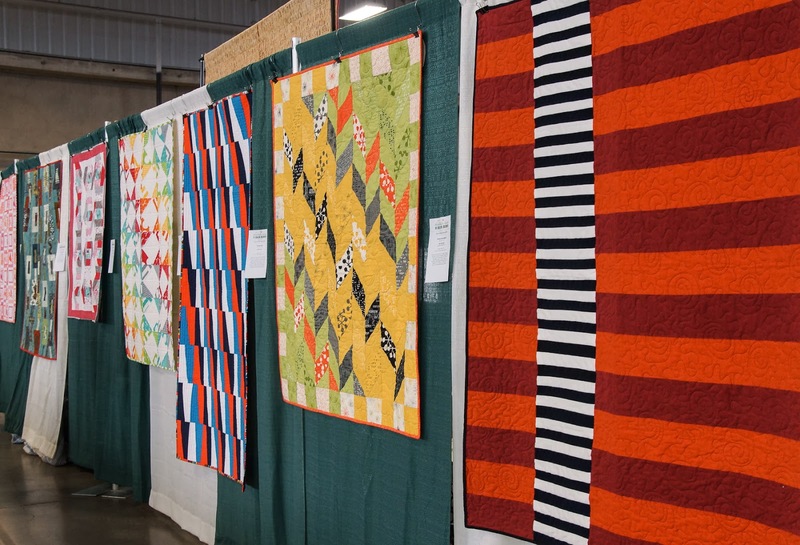 To view all the quilts from the show, see our GALLERY SLIDESHOW at the top of the sidebar! That quilt show was a stunning display we can all be proud of! Thanks to everyone who put it together, contributed quilts, manned the booth, and did all the hard work. I had a blast looking at everyone's stuff, and so did Autumn.